Straddled between Nevada and California, the 1000 feet deep blue lake awaits. The second-deepest lake in North America, Lake Tahoe also sits at the base of Snow Valley Peak, which rises more than 9000 feet above. 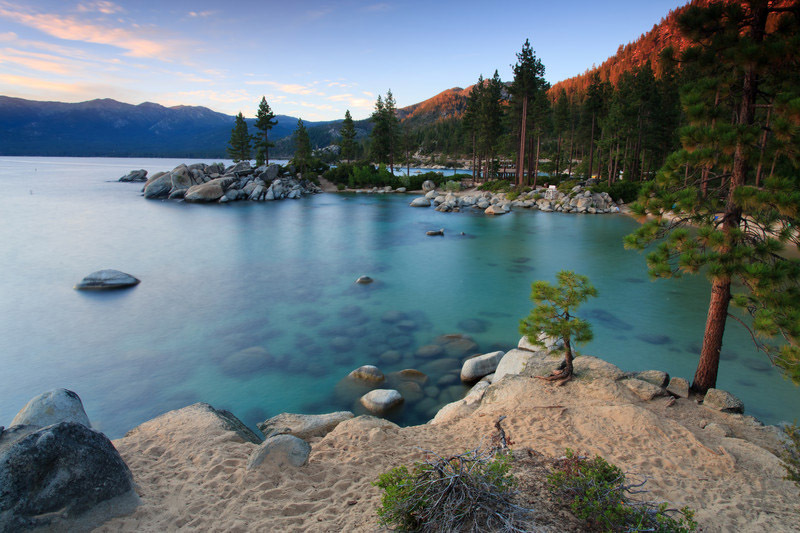 Whether you like forests, mountains, or water, Lake Tahoe’s topography has something for you. Tourists come, not just for its gorgeous scenery, but for the casinos, its ski resorts, its golf courses, and its scuba diving. History buffs delight in the Railroad Museums, Donner history, and 1960 Olympic sites. Sound like fun? 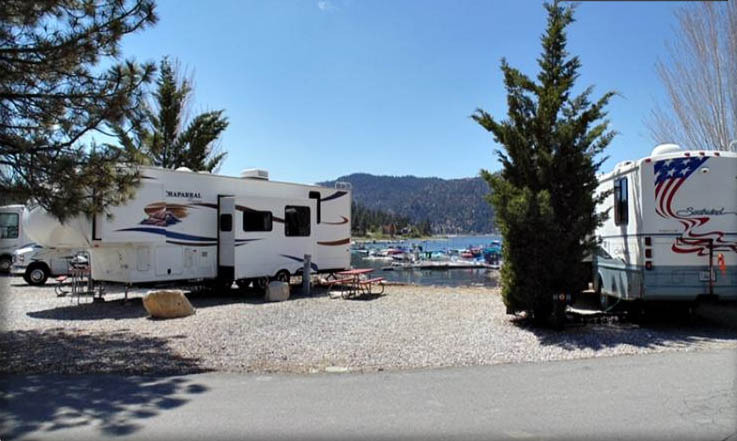 Check out these three RV campgrounds near Lake Tahoe. 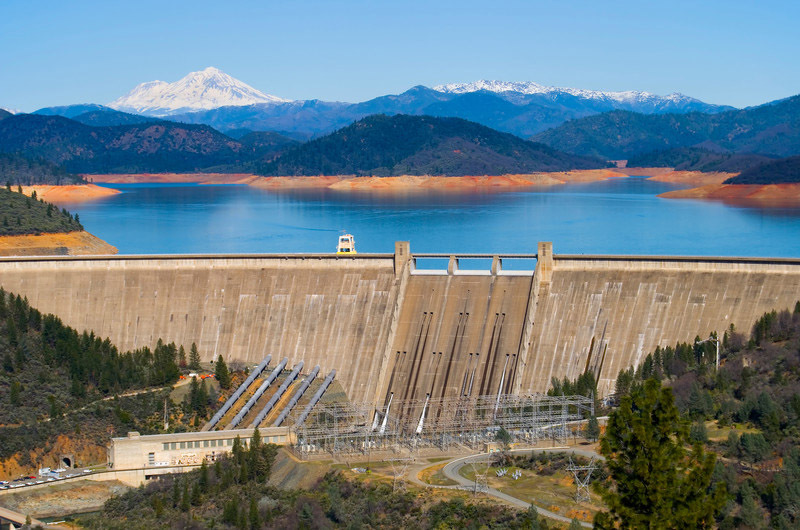 While everyone calls it “Shasta Lake,” this body of water is actually a reservoir in northeast California, held in by the Shasta Dam, the ninth largest dam in America. On this beautiful body of water, you can rent any kind of water craft imaginable, (the lake has a huge houseboat fleet for floating luxury) and you can catch just about any kind of fish imaginable. Turtle Bay Exploration Park and Museum is nearby, as is the Sacramento River National Recreation Trail, The Lake Shasta Caverns, and Shasta State Historic Park. Explore the 360 miles of coast on this beautiful lake. And don’t forget to bring your RV so you can stay. If asked about your first thought of Arizona, it probably wouldn’t be about beautiful lakes. But Lake Havasu City is just that. It’s a park in western Arizona with beaches and mountain views. 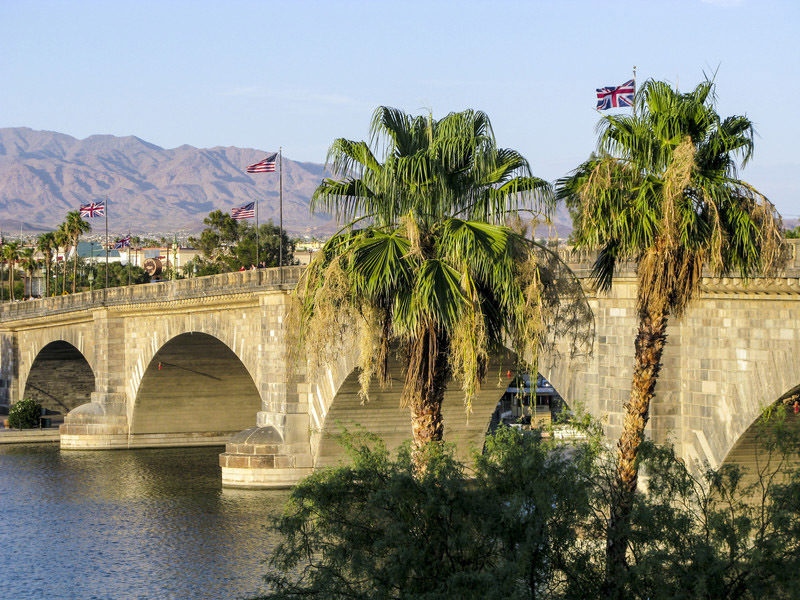 And you probably never thought that London Bridge stands on Lake Havasu after being relocated from England! 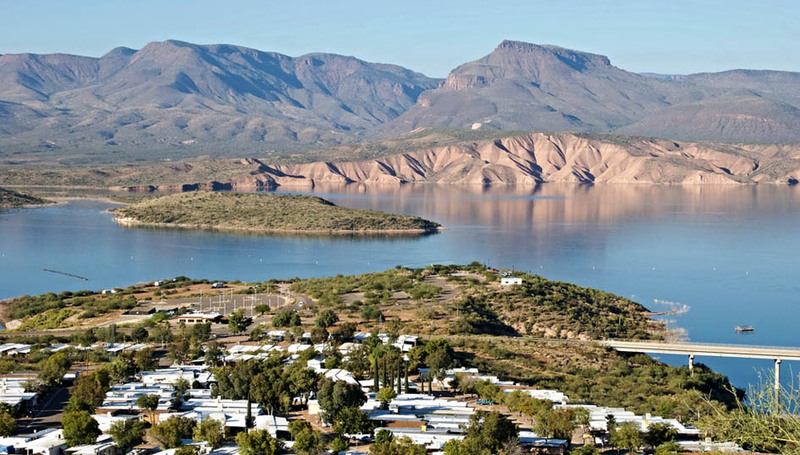 The area is known as the place to start desert trails or wander a long path on what is known as “the Island.” In addition, it is a hotspot for water sports with lots of marinas and more than 60 miles of navigable waterways. History buffs can study Native American culture and steamboat history at the Lake Havasu Museum of History. Perfect place for RV campers. 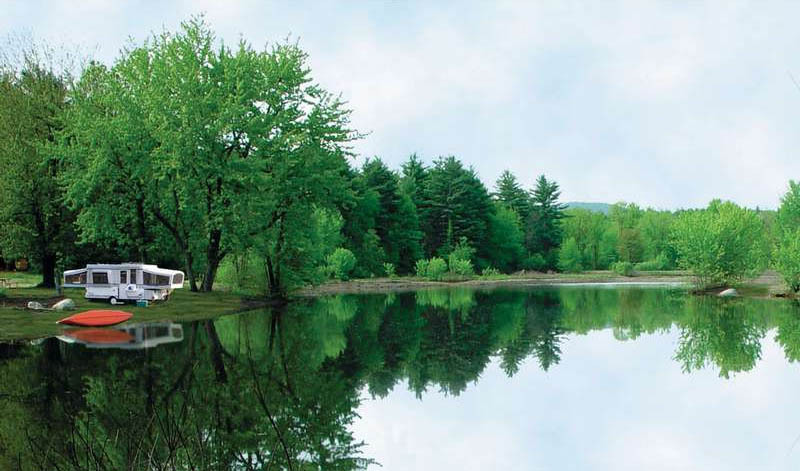 Coming in at #2 on our Top 15 RV destinations in the USA. 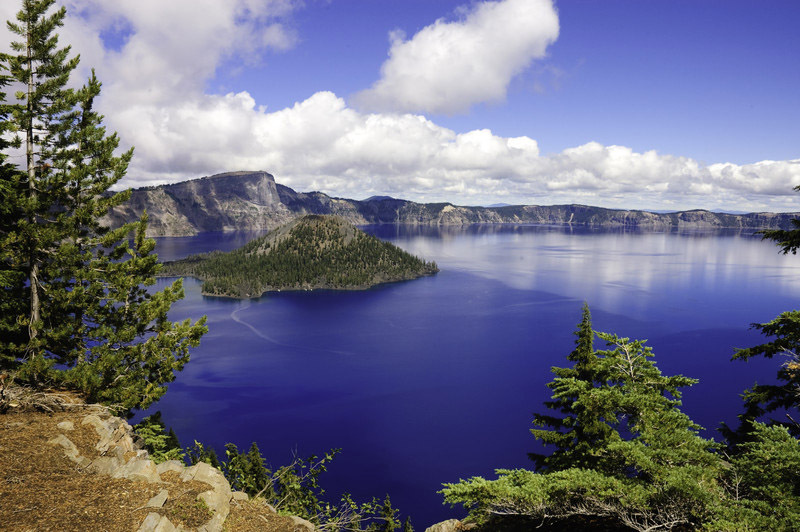 President Roosevelt welcomed Crater Lake into the National Park system in 1902, making it the 6th oldest national park. Known for its intense blue water and deep, deep depths (up to over 1900 feet deep) Crater Lake is open all year, although some areas are inaccessible in the winter. You can take a tour of the lake, or you can hope on a trolley tour that takes you around the 33-mile Rim Drive. If you love biking, scuba diving, hiking, this is the place. Winter sports lovers appreciate snowshoeing and cross-country skiing. Endangered species of lynx, northern spotted owl, and tailed frog exist here, along with more than 70 other species of mammals roam in this Oregon park. Situated in a horseshoe-shaped canyon, June Lake sits against the western rim of the Great Basin and Range Province. 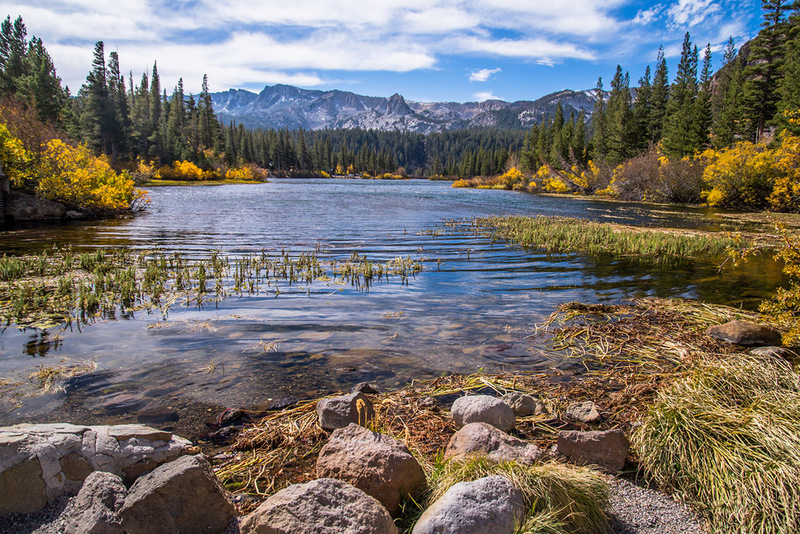 Because it’s nestled in hills and surrounded by meadows, June Lake is often called the Switzerland of California. 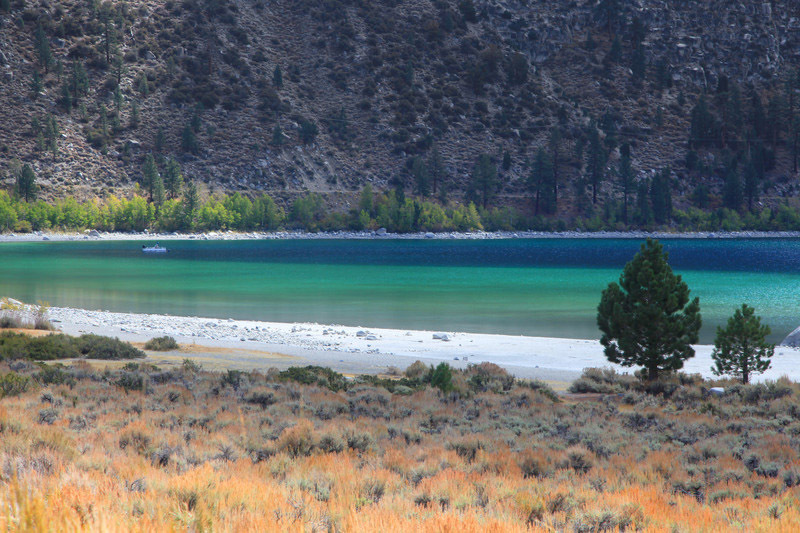 June Lake is a perfect place for fishing, whether you like to fly fish, spin cast, or bait fish. There’s a small beach for swimming during the hottest part of the summer, and numerous trails lead through the Ansel Adams Wilderness Area. The trails are often steep and strenuous, so avid hikers can enjoy a challenge. Nearby equestrian centers provide horseback riding and backcountry trips. Winter sports are also enjoyed. The amazing Rainbow Bridge is located on Lake Powell, Utah. This is a sight you won’t want to miss. Rainbow Bridge is the tallest natural bridge in the world. The Navajo Indians see this natural rock formation as a sacred thing. Standing 290 feet tall and 270 feet across, Rainbow Bridge is as long as a football field, and it is taller than the U.S. Capitol Building. While you’re at Lake Powell, visit the Glen Canyon National Recreation area, the Grand Staircase-Escalante National Monument, or the quaint little town of Kanab which makes you feel like you’re stepping back in time to the Old West. 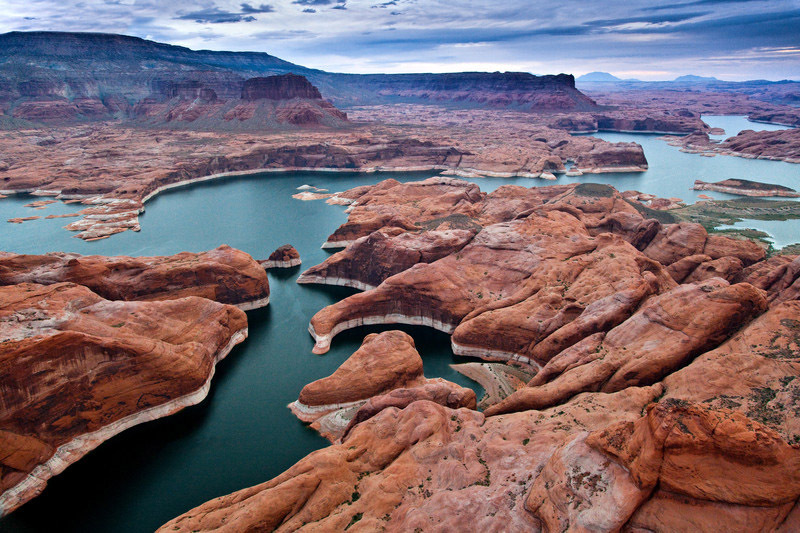 Lake Powell is a prime destination for any kind of boating. 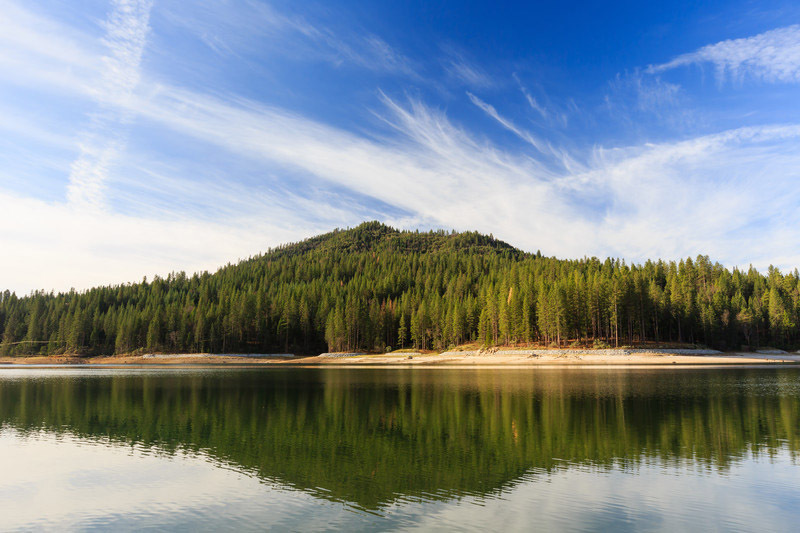 Just 14 miles from Yosemite, Bass Lake sits in the Sierra National Forest in California. The nearby Madera County Main Visitor’s Center can help you plan your trip to Bass Lake and surrounding areas. This is the perfect place to camp and venture out to Yosemite, take a photo safari, or rennet a boat and spend time on this beautiful lake. Visit a winery, a children’s museum, or just rest and relax. As the name implies, this is the place to fish. Catch a monster catfish. Catfish as big as 22 pounds have been hooked. This gorgeous lake and surrounding area bring more than 4 million tourists to the region each year. Lake Arrowhead used to be called Little Bear Lake, but when land developers purchased the ground in 1920, the name was changed. While you’re there, take the Arrowhead Queen Tour Boat. Visit the sky park at Santa’s Village. (Who doesn’t want to see Santa?) 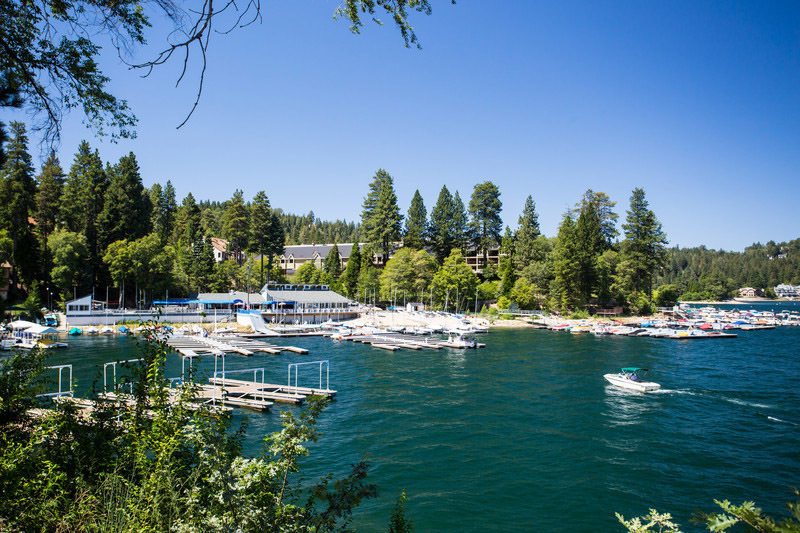 Enjoy shopping, fine dining, and special events at Lake Arrowhead Village. Located in San Bernardino, California. Park your RV at Lake Mead and you’ll be just 14 miles from Las Vegas where you try your luck at the most interesting casinos in the world. Lake Mead in Nevada is on the Colorado River and is the largest reservoir in the U.S. Nearly 20 million people get their water from this source created by the Hoover Dam. While you’re there, you’ll definitely want to see Hoover Dam and the Mike O’Callaghan-Pat Tillman Bridge. Go fishing for striped bass, channel catfish, or largemouth bass. You’ll have more than 1.5 million acres of stunning scenery to view. Washington State boasts this lovely lake with more than 300 days of sunshine each year. Whatever you like to do, Lake Chelan has it. There are wineries and vineyards along with cider and ale tours. You can golf, mountain bike, hike, and fish. (The state record for the biggest fish caught came from Lake Chelan. . .a whopping 35 pounder. Lots of rentals for sports equipment are available around this more than fifty-mile long lake. Lake Chelan is a great stop before visiting North Cascades National Park. Located in Fresno County, California, Shave Lake is named for C.B. Shaver, the man who started the Fresno Flume and Irrigation Company responsible for building the dam that created the lake. Of course, there are all the normal water activities that come with being near a gorgeous lake. Check out the Central Sierra Historical Society where you can learn the history by seeing artifacts and antiques. 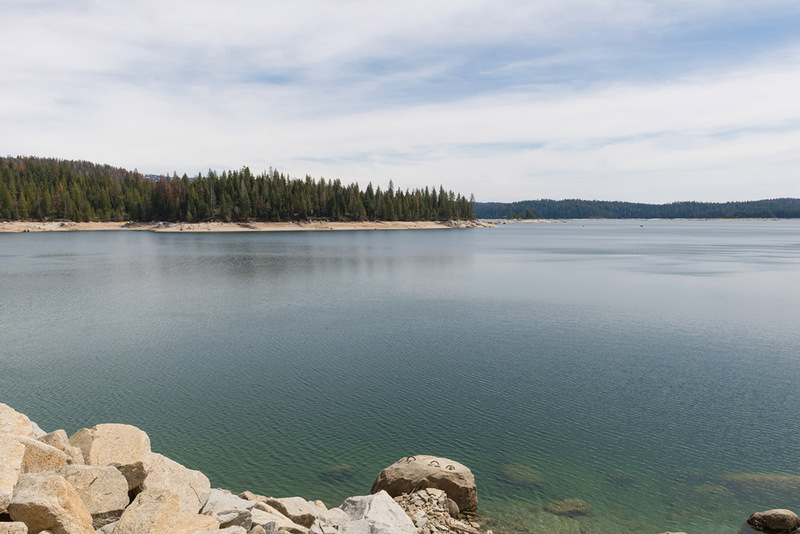 Whether you like to hike, fish, or go horseback riding, you can do it at Shaver Lake. Does the “Devils Postpile” sound like an interesting destination? You bet. The Devils Postpile is a National Monument comprised of basalt columns at Rainbow Falls. Nearby is the John Muir trail, which runs for more than 210 miles. Check out Mammoth Mountain, just west of the lake. This huge, domed mountainous area now offers a huge ski resort. Rainbow Falls is another great site, the highest waterfall in the Sierra Nevada mountain range, they fall from more than 100 feet to boiling water beneath and bring forth rainbows in the misty water. The wetlands of Lake Almanor are a breeding ground for dozens of waterfowl, as well as home to bald eagles, osprey, and herons. Lake Almanor is a reservoir that is home for Brown bullheads, bluegill, Golden Shiners, and Brook trout. The Almanor Park and Recreation Department offer all kinds of classes and events, like Judo and Jujitsu every Thursday. Lassen Volcanic National Park is close by. Winter sports are popular at Lake Almanor, so if you enjoy snowshoeing, cross-country skiing, or snowboarding, this is the place for you. In the summer, indulge in waterskiing, swimming, running, hiking, boating, and fishing. Canyon Lake is a relatively new community in Texas. This residential area sprung up when the lake was developed in 1964. 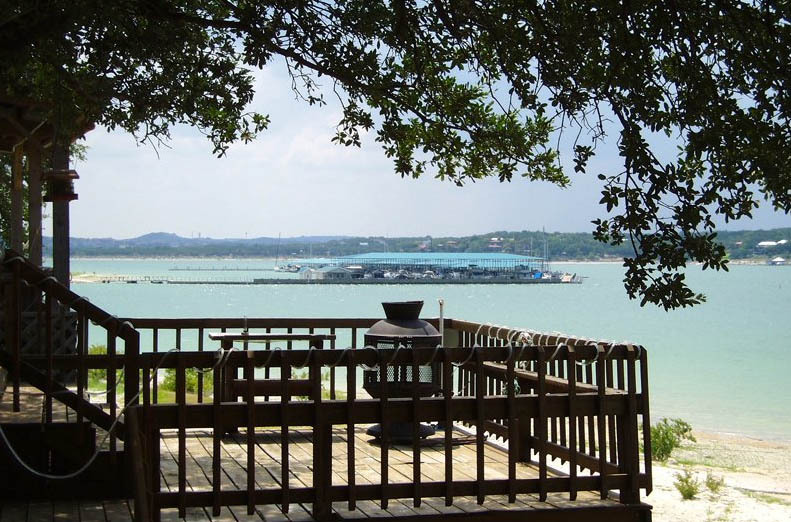 Just 40 miles from San Antonio, Canyon Lake offers proximity to a large city and the quiet of lakeside town. The Natural Bridge Caverns are nearby and are open daily. Check out these massive rock formations. You can also tour a mining company and pan for treasure and precious gemstones. The amazing Ranch Roundup is a 5000 square foot maze, an outdoor activity that will tease and test you. Napa Valley holds the beautiful Lake Berryessa. Lake Berryessa, California is a reservoir, but it’s so much more than that. Surrounded by mountain vistas of the Blue Ridge and Cedar Roughs ranges, the lake is also home to a dozens of species of wildlife. Birds, turkeys, and deer abound. A marina provides all kinds of boat rentals. Come picnic. Bring your cameras. Don’t forget binoculars. Lake Berryessa will delight you visually. The name alone makes me want to go to this lake on the Brazos River in Palo Pinto County, Texas. Lots of legends exist on how the place got its name, but the most common version credits Ike Sablosky, a Russian Jew who immigrated at the age of 13 and arrived in Texas in 1905. Sablosky thought he was dying because of stomach trouble, but he worked out a deal with a hotel employee to drink all the mineral water for ten cents per day. He was cured and went into the fur and hide trade, dealing in possum pelts. In addition to an interesting history, Possum Kingdom Lake is home to Hell’s Gate which is a break in the cliffs around the lake. 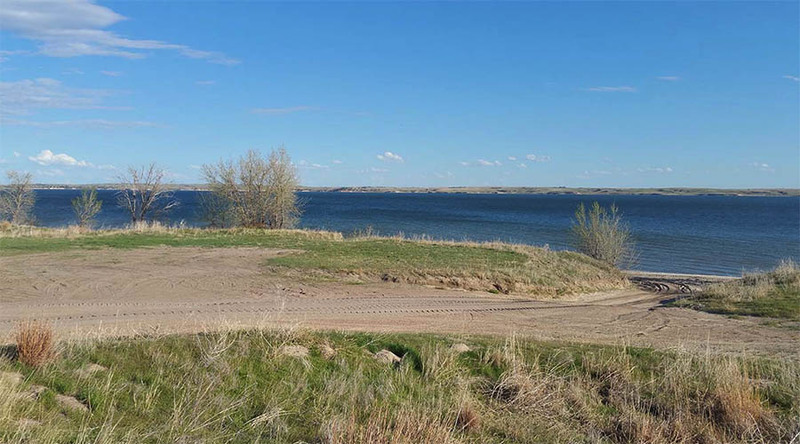 This 10,000-acre lake was the result of the Carl Pleasant Dam and is part of a regional park that is over 23,000 acres. 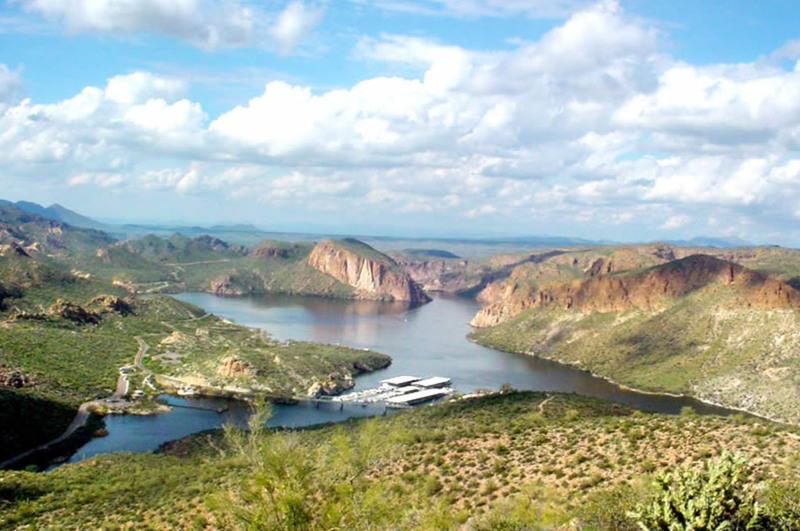 Located not far from Phoenix, Arizona, Lake Pleasant is a major hub of outdoor activity. A dirt racetrack and glider airport are nearby. 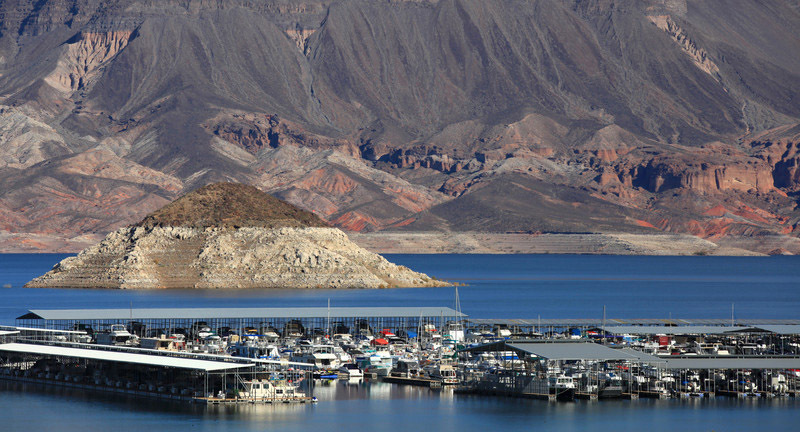 Filled with all kinds of bass, crappie, catfish, tilapia, carp, and sunfish, Lake Pleasant is a prime destination for anglers. 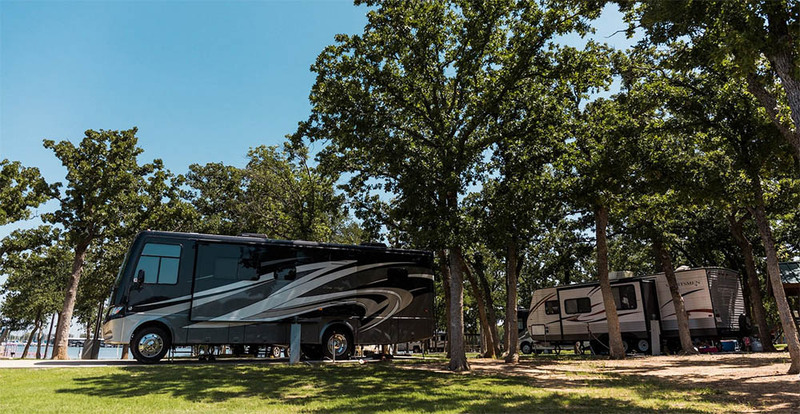 Perfect location for RV camping because of its proximity to both Phoenix and Peoria while providing a picturesque retreat and recreation area. Formed in 1942, Lake Travis was created by the building of Mansfield Dam outside of Austin, Texas with the sole purpose of containing floodwaters in an area prone to flash-floods. Other purposes soon became apparent as Lake Travis is a great spot for fishing, boating, swimming, and camping. Nearby is a Travis County park called Hamilton Pool Preserve, an unusual and lush park centered around the most beautiful places you’d ever want to swim. Missouri is calling you. Lake of the Ozarks is waiting filled with fun. The area is known for its caves and caverns, and many attractions are based on exploring these. Take a lantern-lit cave tour at the Lake of the Ozarks State Park, just one of two State Parks in the area. There’s even a Bridal Cave, a unique venue that hosts weddings and tours. There are wineries, indoor and outdoor water parks, go-carts and bumper cars, miniature golf, and live music and entertainment. Restaurants and shopping for your pleasure. Truly something for everyone at this local in the heart of Missouri. Miles and miles of pristine beaches attract visitors that delight in sun and sand. So many beaches, in fact, that Lake Michigan is often referred to as “the Third Coast of the United States.” So much sand that massive, beautiful sand dunes roll along the eastern side of the lake, resulting in breathtaking topography. Lake Michigan is the only one of the Great Lakes that does not border Canada, but both Chicago, Illinois and Milwaukee, Wisconsin do sit next to the lake. Ferries, islands, light houses, cities, sand dunes, city life and camping ecstasy are all part of life on Lake Michigan. Just 100 miles outside of Los Angeles, a year-round respite exists in Big Bear Lake. Ziplining, off-road four-wheeling, horseback-riding, snow-skiing, rock-climbing, and snow-boarding are just a few of the activities at Big Bear Lake. The charming Big Bear Village offers live offers shopping and dining. Additional activities include the Big Bear Visitor’s Center, Alpine Village, and History Museum. The location is known for it’s clear skies and moderate temperatures. Don’t miss it. “The Jewel of the Blue Ridge Mountains,” this get-away spot is located in beautiful Virginia between Roanoke and Lynchburg. 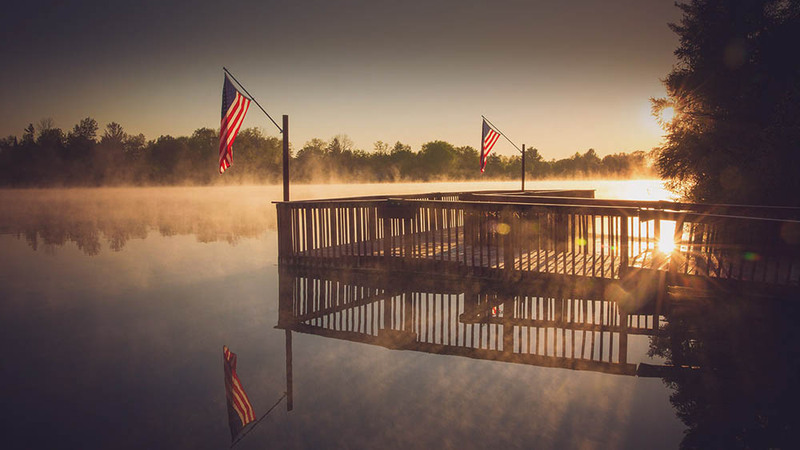 The Lake offers excellent fishing and has even hosted competition fishing events because of the Large, Small-Mouthed, Striped Bass, and Channel Catfish that live in the waters. The town of Smith Lake provides eateries, grocery stores, and shopping. Friendly residents of the town welcome visitors. History buffs will want to visit Roanoke, The Crooked Road Music Trail, the Booker T. Washington National Monument, and the History Museum of Western Virginia. Great camping everywhere. Spanning two states, Bear Lake spans the borders of Utah and Idaho. It is a natural, fresh-water lake, encompassing more than 100 square miles. 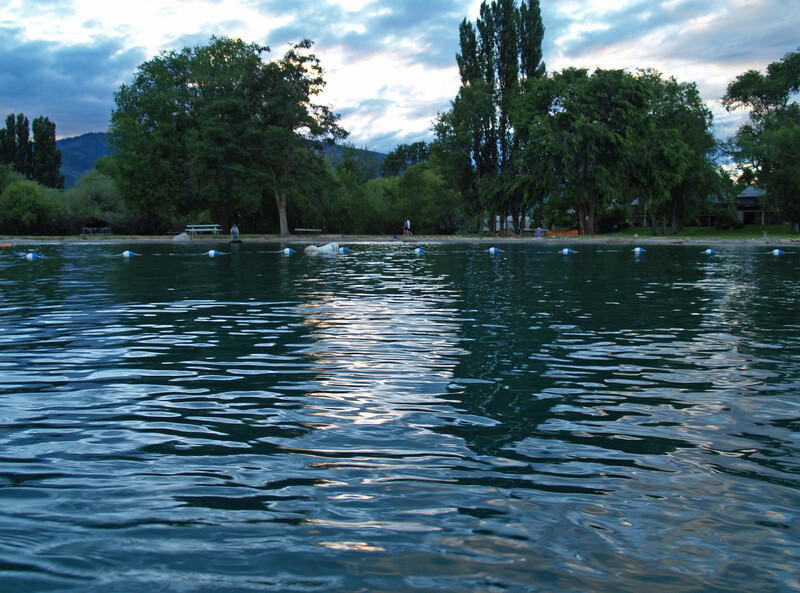 Minerals, specifically calcium-carbonate, are suspended in the water of the lake and make it appear to be a sparkling, distinctive, aqua-blue hue. Beaches abound. There is a marina, a day-use area, and a state park. Bear Lake is a beautiful place to camp. Lake Lanier is a reservoir created in 1956 by the damming of the Chattahoochie River by the Buford Dam in Georgia. Located just 45 minutes north of Atlanta, Lake Lanier is the perfect escape from the bustle of the city, less than an hour’s drive away. Lake Lanier’s location makes it a perfect travel destination. 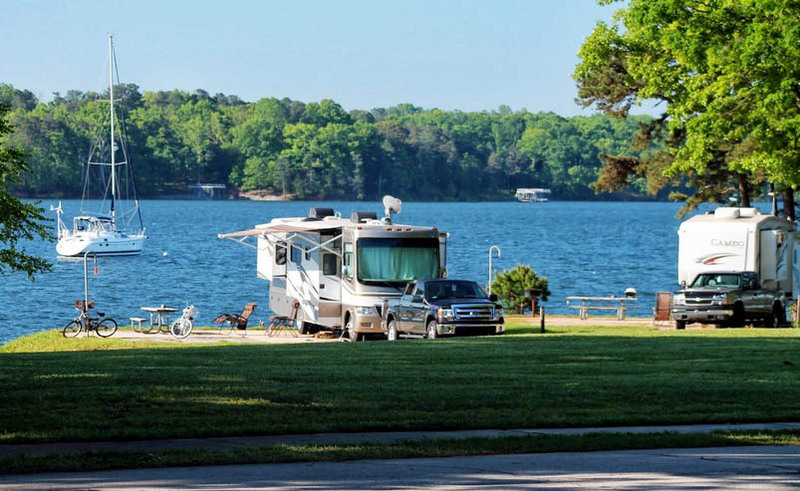 You can experience the sights of Atlanta and still relax in a quiet get-away at Lake Lanier. Dozens of parks located near the lake provide fishing, swimming, boating, and a water slide. When Roosevelt Lake was created in Arizona in 1911, the Roosevelt Dam was the tallest masonry dam in the United States. The lake’s location on the Salt River makes it a hotspot for anglers. Fisherman flock to the waters hoping to catch a trophy bass or catfish. Jet-skiing, leisure boating, water-skiing, and swimming draw outdoor lovers to the area. There’s a wildlife refuge, a general store, and multiple marinas. Explore the nearby ghost town of Tortilla Flats, or take the most scenic drive in Arizona, the Apache Trail Route. Flathead Lake is situated in northwest Montana. It is the largest natural, freshwater lake West of the Mississippi and is a deep, clear-water lake. 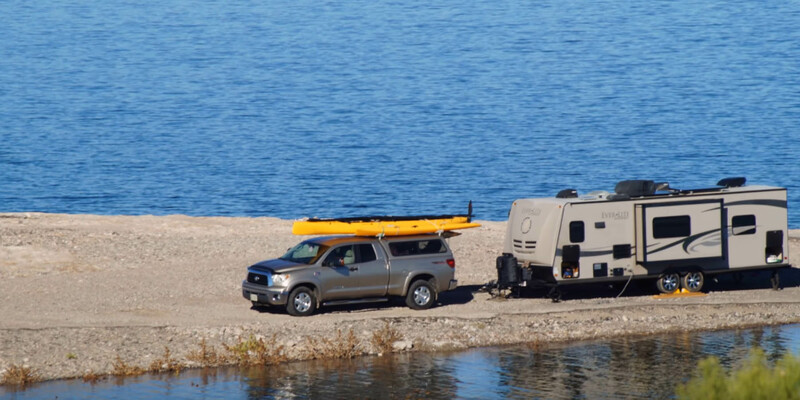 Flathead Lake is just 30 miles south of Glacier National Park, so it’s a great place to use as a home base for your RV. Travel north to the picturesque town of Kalispell. 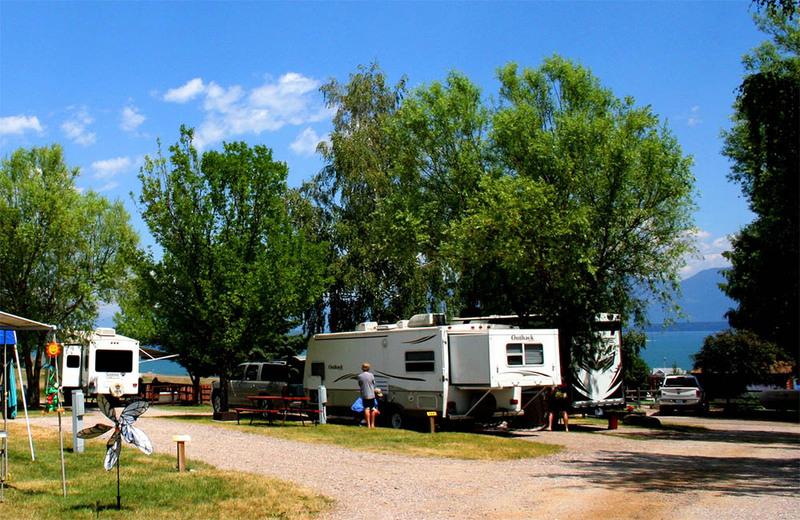 Travel south to the lovely little town of Polson, Montana with well-maintained, beautiful public areas with water access for swimming, boating, or strolling. Flathead Lake is a quiet destination with loads of charm. In the summer, . . .dozens of cherry orchards promote their bounty of lush cherries in both red and white varieties. Loads of campgrounds! Lake George is both a town and a lake nestled in the lush old forests of the Adirondack Mountains in New York. Camping is one of the biggest draws here, and sights are available on little islands and along the beautiful waterfront. Hikers and mountain-bikers can enjoy miles of trails. Fishermen can boast of tremendous catches. Families can enjoy everything from shopping and restaurants to miniature golf and historical attractions. The William Henry Museum and Restoration is worth a trip. It’s a restored British fort from 1755. Priest Lake is a mountain lake 80 miles northeast of Spokane, Washington, although the lake itself is in northern most panhandle of Idaho. The Selkirk mountains surround this glorious 2300-acre lake. Open year-round, Priest Lake offers fishing, mountain biking, and all varieties of water sports. Make sure to tour the Vinther-Nelson cabin which was a hand-hewn, hand-built cabin built on Eight-Mile Island in 1987. Don’t miss Chimney Rock, a giant granite rock formation that is an iconic landmark of the area. A lake in a desert? You bet. Lake Isabella is located in the Sierra Nevada Desert in Kern County, California. 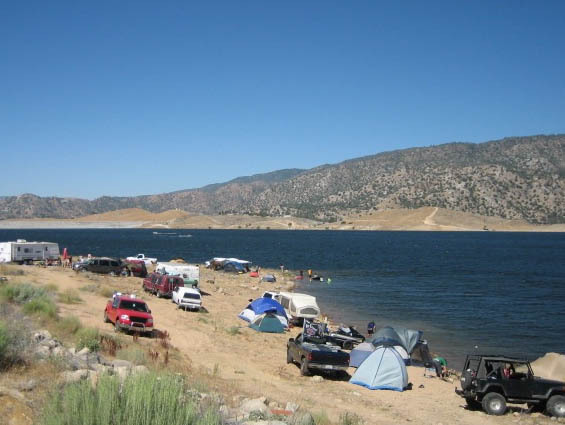 Just 35 miles from Bakersfield, California and not far from Los Angeles, Lake Isabella is a popular outdoor destination. White-water rafting, hiking, biking, fishing, and camping are all activities enjoyed here by nature enthusiasts. Visit the historic Kernville Cemetery with graves dating back to the old west in 1870. Tour the Kern Valley Museum for a taste of what life in the mountainous mining communities was like. More than 3000 square miles in size, Lake Elsinore sits in western Riverside County, California. Originally an old Spanish town, it is now known as a charming resort town. 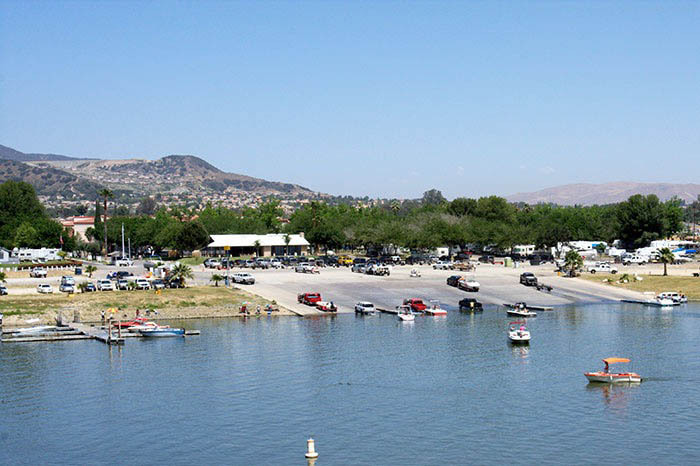 The natural fresh water of Lake Elsinore offers a great place for boating, swimming, and fishing. If you’re feeling adventurous, Skull Canyon offers high-speed zipline lessons and experiences. McVicker Park offers a skate park as well as baseball and softball fields. 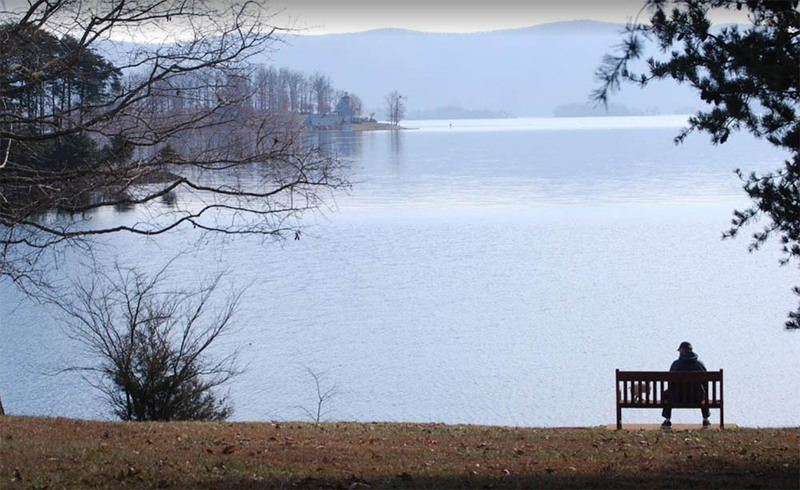 Outside of Hot Springs, Arkansas, lies a quiet but beautiful lake called Lake Ouachita. 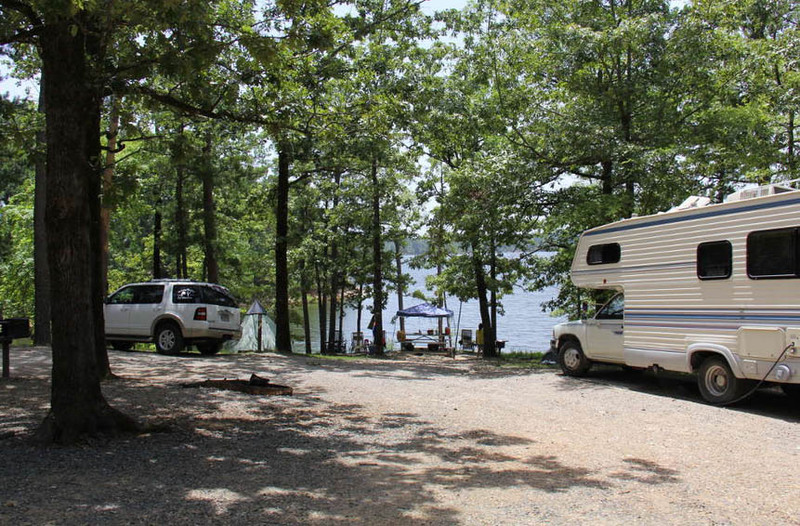 Whether you want to stay in a cozy cabin or live in the comfort of your RV, Lake Ouachita offers a place to enjoy the grandeur of nature. Hot springs bubble at the historic Three Sisters’ Springs. You can fish to your heart’s content and camp until your spirit is revived. Sockeye salmon, brown trout and rainbow trout swim the placid waters just waiting to be caught. Donner Lake is the perfect place for boating, skiing, and sailing. Often called the “Jewel of the Sierra,” Donner Lake is in northeast California. While you’re enjoying the natural beauty, you can also get a history lesson at the Donner Memorial State Park and Emigrant Trail Museum which reminds us of the hardships the westward bound emigrants had to face. No matter what kind of scenery you like, you can get it at Grand Lake, Colorado, “The Soul of the Rockies.” Grand Lake is located within the Rocky Mountain National Park. Winter, spring, summer, and fall, you can view river, forest, and mountain views brimming with wildlife. 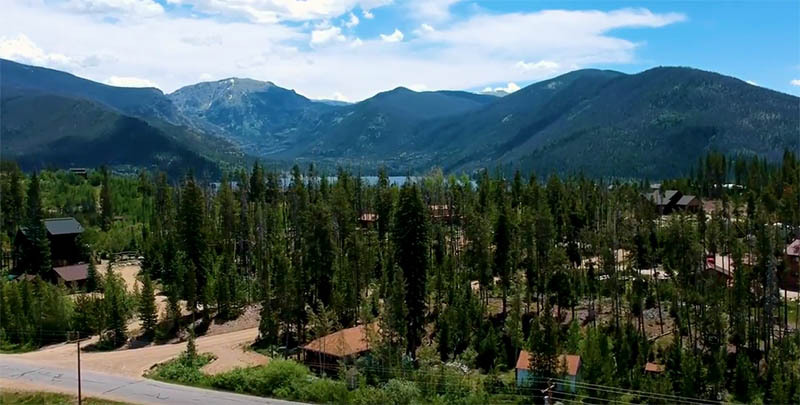 Called the “Snowmobile capital of Colorado,” Grand Lakes offers the best in recreation, including the golf course at the highest altitude in the United States and the world’s highest altitude yacht club. Sleigh rides and ski slopes. Wilderness and wonder. 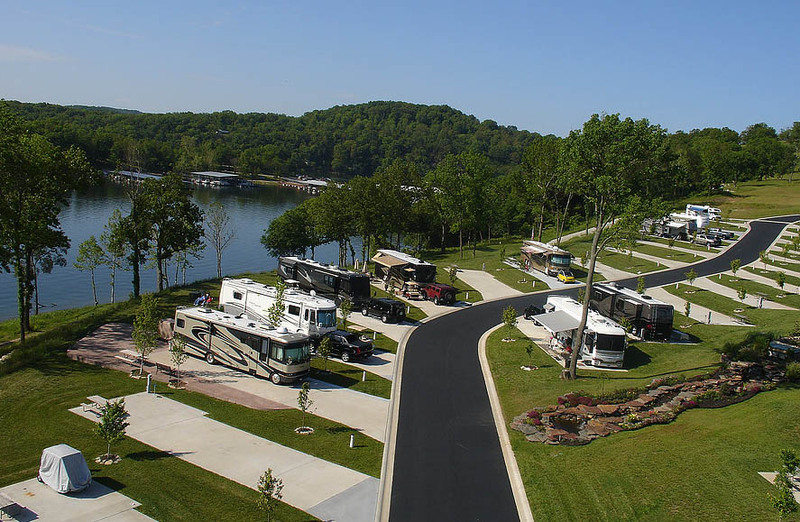 If you want to go to Branson, Missouri – that fabled town of family fun with live music and entertainment – you will want to park your camper at Table Rock Lake. On the border of Missouri and Arkansas, Table Rock offers a beautiful place to camp with easy access to water sports like fishing and boating. The colder water around Table Lake Dam creates the perfect environ for trout, and fisherman enjoy wading in or fishing from the bank. Silver Dollar City is a nearby family amusement park. History lovers will appreciate the nearby Titanic Museum. Camping for RV’s is all around the area. Situated in the Pineywoods of Texas, Lake Livingston is a reservoir just an hour north of Houston. All kinds of water activities are available, and if you don’t own a boat, you can easily rent a kayak, canoe or paddleboat. The nearby town of Livingston has tennis courts, a bowling alley, an 18-hole golf course, and a municipal airport. You can even try your hand at geo-caching at any one of the many surrounding parks. Close proximity to Houston gives you the options of big-city attractions like upscale shopping and restaurant hopping. Lots of camping options are available, and you can even rent a covered, screened-in shelter. Salt Lake City, Utah, is an area rich in history and culture. Of course, there’s Temple Square, a beautiful plaza. Check out the Hogle Zoo. 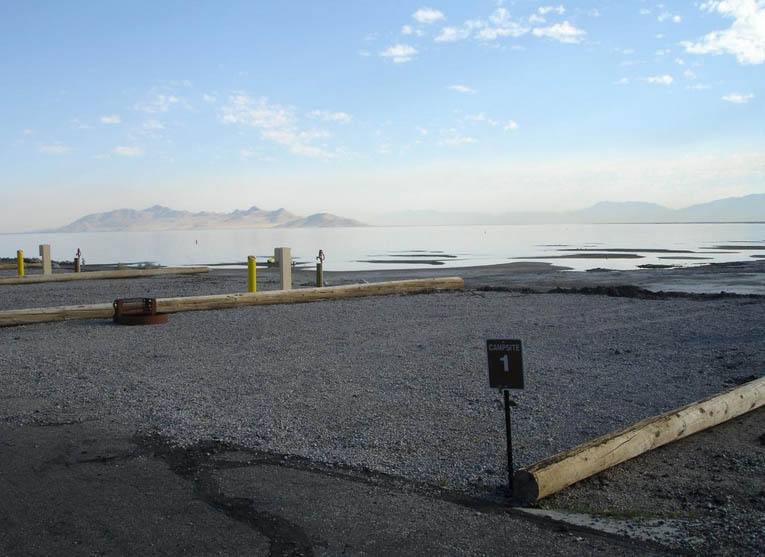 Take a trip to Antelope Island an offshore park featuring a historic home, free-roaming bison, horseback riding, and hiking trails. If you love gardens, be aware that even a city in the desert can have beautiful landscaping as you’ll see at the Red Butte Botanical Garden. The Natural History Museum also has a dynamite café. 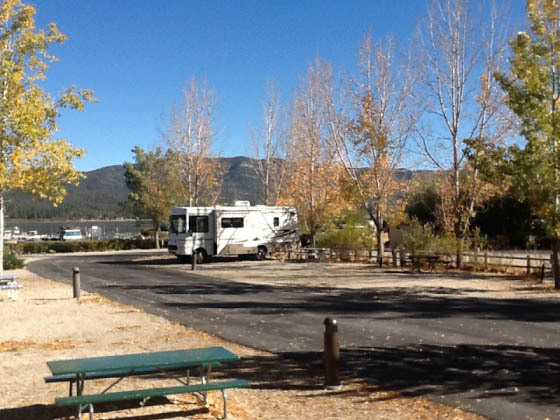 Lots of spots abound to park your RV and travel into the city.